Nurses and medical officers pose in front of the New Zealand Stationary Hospital at Wisques, France. The New Zealand Expeditionary Force was supported by a broad network of medical services. These began with the medical units attached to infantry brigades and some other larger units (such as the New Zealand Stationary Hospital), who catered to the needs of that group of men. These units were linked to the three New Zealand hospitals established in England, and to the wider British hospital system, sending ill and wounded men to these better-equipped facilities when necessary. Veterinary units catered to the needs of the horses and mules which were a key component of the wartime transport system. New Zealand’s battles in Gallipoli, the Middle East and on the Western Front took their toll in lives and limbs – it has been estimated that more than a third of New Zealanders who served in the First World War were wounded at least once. Shellfire and shrapnel punctured flesh and severed limbs; gas poisoned bodies; bacteria from the stinking mud infected wounds. Those who recovered felt the effects for years afterwards; hallucinations and nightmares wracked men suffering from shell-shock. Wounded men would be moved (by stretcher-bearers if necessary) to regimental aid posts for hurried medical treatment. Another team of stretcher-bearers would carry them to dressing stations. There, treatment was limited: bleeding was stopped; splints were applied; wounds were quickly stitched; shock was treated as well as possible; and badly shattered limbs were removed. Morphia and other anaesthetics would be given only in small doses, if at all. The use of penicillin for fighting infection had not yet been developed. The wounded were then taken to the relative safety of casualty clearing stations, which were often a few miles from the dressing station. Ambulances (motorised or horse-drawn) and stretcher-bearers carried those who could not walk. 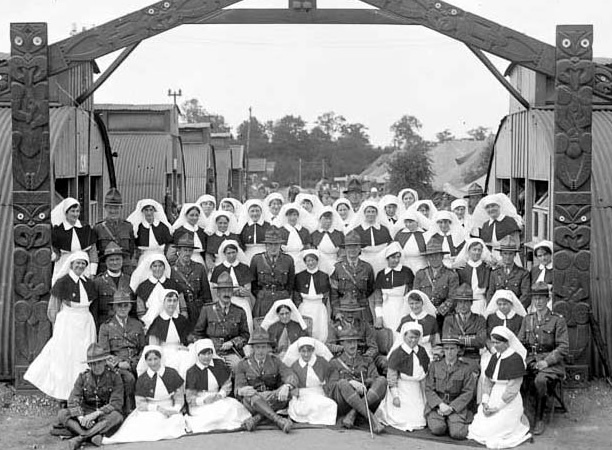 Surgical teams made up of a surgeon, anaesthetist, sister and orderly – worked at clearing stations, along with other medical staff, orderlies, chaplains and stretcher-bearers. Once treated or diagnosed, men would be sent on. Some went to the New Zealand Stationary Hospitals in Hazebrouck or Wisques for more serious operations or treatments. Others went to hospitals in the United Kingdom where some remained for the rest of the war. Still others returned to the front. We have 27 biographies, 40 articles, related to Medical Units.